MONTEREY — The Monterey Public Library, in collaboration with the Monterey Peninsula Japanese American Citizens League, has planned a series of reading and discussion programs as part of California Reads, a program of Cal Humanities Searching for Democracy initiative. The book “Farewell to Manzanar” has been chosen for its examination of the theme of democracy, and will be discussed in the Monterey area. Other titles will be discussed in every region of the state in a wide range of settings (libraries, book festivals and fairs, nonprofits and cultural organizations, bookstores, and educational institutions) from March through November. Monterey Public Library staff and Mas Hashimoto of Watsonville-Santa Cruz JACL, who was interned in Poston, Ariz., will facilitate a discussion of “Farewell to Manzanar” on Monday, March 19, at 6:30 p.m. The library is located at 625 Pacific St. (at Madison Street). 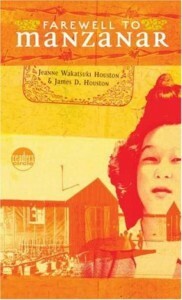 Jeanne Wakatsuki Houston, who co-authored the book with her late husband, James Houston, will participate in another discussion of the book at the Monterey Public Library on Monday, April 16, at 4 p.m.
Other activities will include an “Open House, Exhibits and Conversation” gathering at the JACL Hall, 424 Adams St., on Sunday, April 29, at 1 p.m. The Monterey Public Library is one of 51 library jurisdictions statewide that is participating in the California Reads programs, designed to animate public conversation on the nature and needs of democracy leading into the 2012 elections and beyond. The activities are recommended for adults, teens, and children ages 10-up. California Reads programs are made possible with support from Cal Humanities in partnership with California Center for the Book. For more information about local programs, call (831) 646-3477 or visit www.monterey.org/library.